“Fitness comes in many sizes”……I really like that impact statement from ShapelyGirl™! Debra Mazda was 315 pounds when she discovered that “exercise can transform your body and your life” and she has created a ShapelyGirl™ Revolution and a series of fitness DVD’s designed for curvy women of all sizes and shapes. After struggling with an extra 30 pounds of post pregnancy weight, I am committed to becoming fit and healthy again. I have no expectation (or desire) of ever being a size 2 but I do want to be a healthy and fit role model for my children. For me, diet was never the issue…..I eat organic and natural foods and understand portion control. My issue is dedicating time each day to work out at home and get more cardio activities into my life. 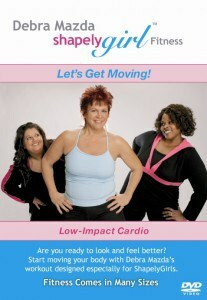 I had the opportunity to try Debra Mazda’s ShapelyGirl™ “Let’s Get Moving” DVD which is a low-impact cardio routine. The exercises were a lot of fun and most impressive was the ease that I was able to follow the workout moves. In the past, I have tried fitness DVD’s in the past that were so hard to follow that I would get discouraged and it would collect dust in my cabinet. “Let’s Get Moving” is a DVD for “real women” in that it felt like I was working out with a group of girlfriends and getting a good sweat in too. Many women will also appreciate the inspirational “Circle Time” and I liked the bonus floor work that was included. If you are a plus sized woman who may have been intimidated in the past by other fitness DVD’s then ShapelyGirl™ Fitness may be just the inspiration that you need to “get off the couch, start moving and change your life!” There is a support community at Debra Mazda’s ShapelyGirl™ website. To learn more about ShapelyGirl™ Fitness DVD’s and online community you are invited to visit the website. “Let’s Get Moving” is available for purchase (beginner/intermediate). $14.96. fitness is for everyone-very motivating! I learned that they have a Tip of the Day on the website! i learned that Getting FIT/HEALTHY and LOSING WEIGHT involves your mind, body and soul. The ShapelyGirl Workout is more than just an exercise routine. It’s a positive way of thinking about your body and your health.